A year old rumor sputters back to life thanks to insiders who have allegedly seen an early version of the Thor movie. 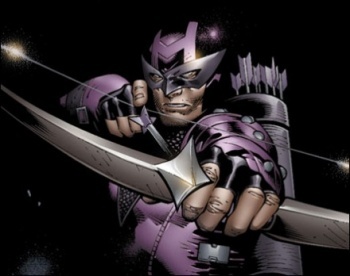 Sources close to the Thor movie are suggesting that the Oscar nominated actor Jeremy Renner - who will play bow-and-arrow wielding hero Hawkeye in the Avengers movie - will make a cameo appearance in the Kenneth Branagh's Thor. The rumors that Hawkeye would have a role in Thor started over a year ago, when Renner - who was only in talks for the part at the time - said that he thought the character would have a cameo in either the Thor or Captain America movie, and then follow it up with a larger role in the Avengers film. Renner later downplayed the idea that he would be appearing in Thor though, saying that it was just an idea that Marvel had had, and it had been blown out of all proportion. But an insider who has supposedly seen a rough cut of the film has confirmed that Renner is indeed in the movie, although didn't say exactly where he turns up or what he was actually doing. They did confirm, however, that Samuel L. Jackson - who plays SHIELD boss Nick Fury - does not appear in the movie. Obviously this is just a rumor, so the usual rules about taking it with a pinch of salt apply, but it's certainly not outside the realms of possibility. Marvel has all kinds of crossovers between the movies, and for a character like Hawkeye, who isn't going to get a movie of his own, introducing him to audiences before The Avengers comes out makes a lot of sense. Marvel isn't going to spill the beans on this before Thor comes out though, so we're going to have to wait until May 6th, when the movie hits theaters, to find out.